To stay the course or give up. To be positive in the face of risk. To love, and weed out your own bitter roots. You get to choose every day. So do I. And sometimes, yes, it's tough to rise above the noise of your own brain and do the internal work necessary to keep your mind and spirit healthy. Mental health workouts are as tough as going to the gym, but we all need to do it. The first step is to wake up, become aware, know that we can choose every moment of every day how we will react -- no matter what happens to us. This is what it's like to be a grown-up. I remember reading something that Aussie fitness guru, Michelle Bridges, said: "I can't tantrum like a child, or behave like a child. And I can't eat like a child. I'm an adult and I have to eat like an adult." Be an adult: that's our job. And it all starts with our ability to choose. No matter what happens, no matter what the circumstance, we can choose our thoughts, then generate better feelings. 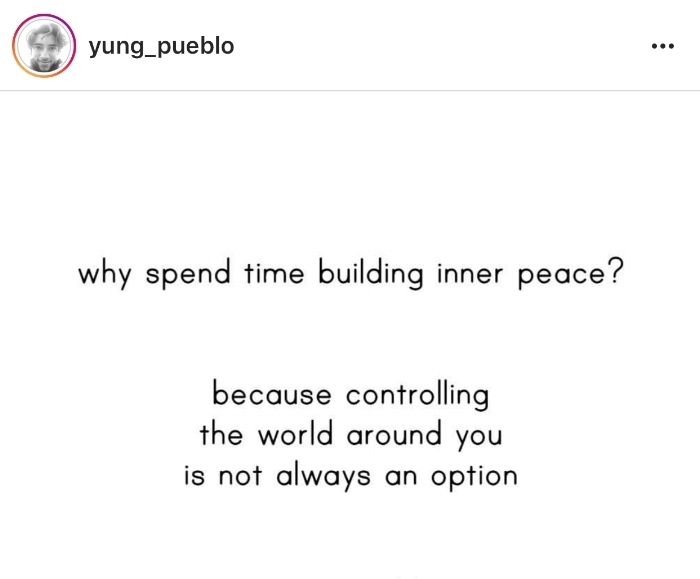 I love this quote from @yung_pueblo on Instagram. It made me laugh at my own crazy brain. He is so right. Controlling the world is not an option. But all of us have the ability to start with ourselves. Choose better thoughts. Choose kindness (especially toward ourselves). Choose to have more fun -- and to be more fun. Maybe it's time to give that a try.